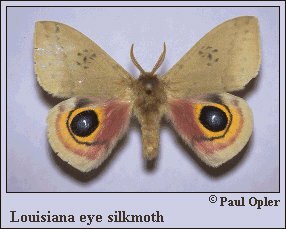 Identification: Upperside brown to light yellow-brown, and the wing margins are yellow to light brown. Hindwings are yellow-brown to orange with pink along the inner margins. Each hindwing has a large black and blue eyespot with a white dash in the middle. Life History: Mating occurs in the early morning before dawn. Females lay eggs on the host plant. Young caterpillars feed in groups, and older caterpillars are solitary. Cocoons are spun in the cordgrass around several leaf blades which are gathered together about 6-12 inches above the ground. Flight: Three to four broods from February to early November. Caterpillar Hosts: Cordgrass (Spartina alterniflora) and possibly others. Range: Southwestern Mississippi, southern Louisiana, and adjacent extreme southeast Texas. Conservation: Populations should be monitored to determine impacts of wetland loss.